We’re led by a team of individuals with world-class experience and skills in health care and corporate management. These established professionals are focused on transforming health care through innovation and collaboration. Kristen Blum currently serves as the Latin America business senior vice president and chief information officer for PepsiCo Inc., a $63.5 billion global food and beverage company. She has served on the GuideWell Mutual Holding Corporation board as well as the Florida Blue board since 2018. Prior to her current role, Blum served as chief information officer for Frito-Lay, a $14 billion business within PepsiCo, and held other senior leadership positions within the company as well. Blum previously served as executive vice president and chief technology officer for J.C. Penney Inc., senior vice president and chief information officer for Abercrombie and Fitch Inc., and in leadership positions for Apple Inc., KPMG Consulting and Disney Inc.
Blum also serves on the board of directors for Sprouts Farmers Market Inc., The National Society of High School Scholars Foundation Inc., and The Ohio State University English Department Advisory Council. Sylvia Mathews Burwell currently serves as president of American University in Washington, D.C., and previously was secretary of the U.S. Department of Health and Human Services (HHS). She has served on the GuideWell Mutual Holding Corporation board and the Florida Blue board since 2018. Burwell’s career spans the public and private sectors and includes multiple senior-level roles in government. Prior to her tenure with HHS, she served as director of the Office of Management and Budget (OMB). Burwell’s appointments to both OMB and HHS were distinguished by broad bipartisan support. Tim Cost is president of Jacksonville University, a private university with more than 4,000 undergraduate and graduate students from 48 states and 47 foreign countries, located in Jacksonville, Fla., and founded in 1934. He has served on the GuideWell Mutual Holding Corporation as well as the Florida Blue board since 2018. Prior to joining the university, Cost held senior management positions with leading organizations in the private sector, including PepsiCo, Kodak, Wyeth, Aramark and Bristol-Myers Squibb. Cost currently serves on the boards of the Federal Reserve Bank of Atlanta; Brooks Rehabilitation; Jacksonville Chamber of Commerce; Stein Mart Inc.; Web.com Group Inc.; the Jacksonville Civic Council Inc.; WJCT, northeast Florida’s public media outlet; and the Jacksonville Symphony. 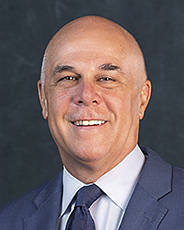 Patrick J. Geraghty is chief executive officer (CEO) of GuideWell Mutual Holding Corporation, Florida Blue and GuideWell Group, Inc. GuideWell is a mutual insurance holding company and is a family of forward-thinking companies focused on transforming health care. The holding company includes Florida Blue, GuideWell Connect, GuideWell Health, GuideWell Source and PopHealthCare. Geraghty is active in leading professional and community organizations. He serves as the chair of the Florida Council of 100, a private, non-profit, non-partisan organization of Florida business leaders who advise the state’s governor on how to improve the economic growth of the state and the economic well-being of its residents. He also serves as a member of the board of the National Institute of Health Care Management (NIHCM), a non-profit organization dedicated to improving the effectiveness, efficiency and quality of America’s health care system. Additionally, Geraghty is a member of the Oliver Wyman Innovation Center Advisory Board and serves on the boards of Pardee Rand Graduate School, America’s Health Insurance Plans (AHIP) and Tampa Electric Co. (TECO). He holds a Bachelor of Arts from Colgate University and has completed executive education programs at Harvard University School of Public Health and the Wharton School at the University of Pennsylvania. Steven T. Halverson is retired chief executive officer and current chairman of The Haskell Company, which ranks among the foremost design-build organizations in the U.S. The company provides planning, architectural, engineering, construction, program management, real estate, financing and facility management services. He has served on the GuideWell Mutual Holding Corporation board since the beginning of 2014 and on the Florida Blue board since 2010. "I appreciate the ability to substantively contribute to this organization, working on one of the nation's most urgent issues," Halverson says. Halverson also serves on the board of directors of CSX Corporation and ACIG Insurance Company. Halverson is past chair and member of The Florida Council of 100, Jacksonville Civic Council, Florida Chamber of Commerce, Construction Industry Roundtable and regional advisory board of Teach for America. He is the recipient of the University of North Florida Presidential Medallion and was inducted into the Florida Council on Economic Education First Coast Business Hall of Fame in 2008. Leerie T. Jenkins, Jr. is the chairman of RS&H, Inc., a privately held architectural, engineering, planning and environmental services corporation. The company is one of the leading facilities and infrastructure consulting firms in the United States. He has served on the GuideWell Mutual Holding Corporation board since the beginning of 2014 and on the Florida Blue board since 2006. "It is an honor to serve on the board of directors for this organization," Jenkins says. "It is my goal to help implement our mission to help people and communities achieve better health." Jenkins is past chair and member of the Florida Chamber of Commerce and is a member of The Florida Council of 100. He is also an honorary member of Leadership Jacksonville. He served as the regional advisory director for BBVA Compass Bank. Jenkins is the recipient of numerous awards including the 2009 Distinguished Alumni Medal from the University of Georgia's College of Environment and Design. Tom Kuntz is a retired corporate executive vice president of SunTrust Banks, Inc. He also served as chairman, president and chief executive officer of SunTrust Bank, Florida. He was responsible for the Commercial and Business Banking lines of business and the company’s 13 geography-based business units – comprised of nearly 1,700 branches and more than 12,000 teammates in 11 states and the District of Columbia. Kuntz has served on the GuideWell Mutual Holding Corporation board as well as the Florida Blue board of directors since 2015. Kuntz is also a trustee of the Alfred I. Dupont Testamentary Trust, a member of the board of trustees of Rollins College, a member of the board of trustees and vice chairman of the University of Florida and a member of the board of directors of the Shands Teaching Hospital and Clinic, Inc.
Tracy A. Leinbach is a retired executive vice president and chief financial officer of Ryder System, Inc., a leading global logistics, transportation and supply chain management solutions company headquartered in Miami, Fla. At Ryder, she was responsible for the corporation's financial management functions including strategic planning, accounting, corporate finance, treasury, bank relations, tax, investor relations, information technology, safety/security, pension fund management and strategic sourcing. In previous roles, she led business divisions in the US, Europe and North America. She has served on the GuideWell Mutual Holding Corporation board since the beginning of 2014 and on the Florida Blue board since 2004. "Health care is one of the most important and challenging issues of our time," Leinbach says. "This organization is in a unique position to positively impact health care and I am pleased to be part of that effort. I am also proud to serve on the board of a company that works first and foremost for the benefit of its members and the communities in which they live." Leinbach also serves on the boards of Hasbro, Inc., Veritiv Corporation, FirstHealth of the Carolinas and St. George Logistics. Harold Mills is the former chairman and chief executive officer of ZeroChaos, a leading global workforce management company. Mills is attributed with building ZeroChaos from inception to a multi-billion-dollar company with operations in over 45 countries. He has served on the GuideWell Mutual Holding Corporation board as well as the Florida Blue board of directors since 2015. "From entry level to senior management, this team of inspired colleagues is working hard every day to provide innovative solutions to one of our nation’s toughest challenges -- providing quality, affordable health care to our fellow citizens. It's an honor to work alongside such a talented group of professionals." Mills is a trustee for a Henry Crown Fellow of the Aspen Global Leadership Council, Florida A&M University (FAMU), and a member of The Florida Council of 100, among others. He also is the former chairman of Florida Citrus Sports, and serves on the board of directors for LIFT Orlando, and the Federal Reserve Bank of Atlanta. John B. Ramil is a retired president, chief executive officer and director of TECO Energy, Inc., a leading energy company located in Tampa, Fla. TECO operates Tampa Electric, a regulated utility company; Peoples Gas System, Florida's largest natural gas distributor; and New Mexico Gas Company. He has served on the GuideWell Mutual Holding Corporation board since the beginning of 2014 and on the Florida Blue board since 2006. John currently serves as chair of the board. "Serving on the board for this organization provides me the opportunity to participate in one of the most important, challenging and dynamic business sectors in the current environment," Ramil says. "Moreover, in carrying out our duties, we are providing cost effective and quality services to our citizens." Ramil also serves on the boards of Emera Inc., The Florida Council of 100, the University of South Florida, and the Moffitt Cancer Center Institute. Previously, he served on the boards of Enterprise Florida, the Florida Chamber of Commerce, the Tampa Bay Partnership, the Tampa Bay Performing Arts Center, the Greater Tampa Chamber of Commerce, Committee of 100, the American Heart Association-Tampa Bay Heart Walk, InRoads Tampa Bay, the Southeastern Electric Exchange and the Florida Electric Power Coordinating Group. Ramil is the recipient of numerous honors including the H.L. Culbreath Profiles in Leadership Award, Tampa Bay Hispanic Man of the Year, and the University of Tampa Ethics Award. Maria Sastre is the former president and chief operating officer of Signature Flight Support Corporation, the world’s largest and market leading fixed base operator network, for business, government, and private aviation with over 200 locations in North America, South America, Europe, Africa and Asia. She has served on the GuideWell Mutual Holding Corporation board as well as the Florida Blue board of directors since 2015. Sastre also serves on the board of directors for General Mills, Helios Education Foundation, Miramar Services and The Conference Board. Attorney Frank Scruggs is a partner in the Florida business law firm Berger Singerman. He advises companies and executives regarding employment law, negotiates employment and severance agreements, litigates employment disputes, and handles complex commercial litigation. He served as secretary of labor and employment security for the State of Florida. Scruggs has served on the GuideWell Mutual Holding Corporation board since the beginning of 2014 and on the Florida Blue board of directors since 1995. "The values of this organization align closely with my commitment to serving the common good in every role: attorney; executive in the public and private sectors; university trustee; and active citizen," Scruggs says. "The company's mission is a form of civic ministry that benefits virtually every Floridian. I am honored to render this form of public service." Scruggs also is on the board of directors of SunTrust Banks, Inc. and NACD Florida Chapter. He is a trustee emeritus of the University of Miami, senior member of the Orange Bowl Committee, and member of the Broward Workshop. He is listed in Best Lawyers in America, Florida Trend Legal Elite, Florida Super Lawyers, and the South Florida Legal Guide.